Nov. 7, 2017 — Obstructive sleep apnea (OSA) may put elderly people at greater risk of developing Alzheimer's disease (AD), according to new research published online in the American Thoracic Society's American Journal of Respiratory and Critical Care Medicine. In "Obstructive Sleep Apnea Severity Affects Amyloid Burden in Cognitively Normal Elderly: A Longitudinal Study," researchers report that biomarkers for amyloid beta (A? ), the plaque-building peptides associated with Alzheimer's disease, increase over time in elderly adults with OSA in proportion to OSA severity. Thus, individuals with more apneas per hour had greater accumulation of brain amyloid over time. According to the authors, AD is a neurodegenerative disorder that afflicts approximately five million older Americans. OSA is even more common, afflicting from 30 to 80 percent of the elderly, depending on how OSA is defined. "Several studies have suggested that sleep disturbances might contribute to amyloid deposits and accelerate cognitive decline in those at risk for AD," said Ricardo S. Osorio, MD, senior study author and assistant professor of psychiatry at New York University School of Medicine. "However, so far it has been challenging to verify causality for these associations because OSA and AD share risk factors and commonly coexist." The study included 208 participants, age 55 to 90, with normal cognition as measured by standardized tests and clinical evaluations. None of the participants was referred by a sleep center, used continuous positive airway pressure (CPAP) to treat sleep apnea, was depressed, or had a medical condition that might affect their brain function. The researchers performed lumbar punctures (LPs) to obtain participants' cerebrospinal fluid (CSF) soluble A? levels, and then used positron emission tomography, or PET, to measure A? deposits directly in the brain in a subset of participants. Surprisingly, the study did not find that OSA severity predicted cognitive deterioration in these healthy elderly adults. Andrew Varga, MD, PhD, study coauthor and a physician specializing in sleep medicine and neurology at the Icahn School of Medicine at Mount Sinai in New York, said this finding suggests that these changes were occurring in the preclinical stages of AD. "The relationship between amyloid burden and cognition is probably nonlinear and dependent on additional factors," he added. This study finding may also be attributable to the study's relatively short duration, highly educated participants and use of tests that fail to discern changes in cognitive abilities that are subtle or sleep-dependent, the authors wrote. "Results from this study, and the growing literature suggesting that OSA, cognitive decline and AD are related, may mean that age tips the known consequences of OSA from sleepiness, cardiovascular, and metabolic dysfunction to brain impairment," Dr. Osorio said. "If this is the case, then the potential benefit of developing better screening tools to diagnose OSA in the elderly who are often asymptomatic is enormous." 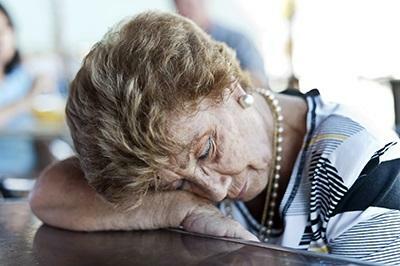 "Study finds #sleep apnea, specifically #OSA, may increase risk for #Alzheimer's disease."